Marinade Injectors | Patio and Hearth Co. Heavy-duty plastic marinade injector features volume markings to keep track of how much liquid has been injected. 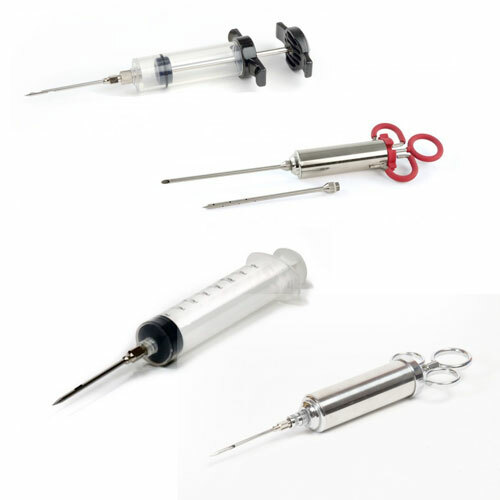 Stainless steel needle design resists clogging. Made of all stainless steel, this marinade injector is serious business! The injector features two handles to help keep a steady grip while pushing marinade into poultry or other meats. The needle design is resistant to clogging. Infuse your meat with flavor and moisture in less time than it takes to marinate it! With this injector, you can add your choice of marinade, brine, or other liquid right where it needs to be: on the inside of your meat. This marinade injector includes two needle tips for different kinds of marinade: use the single-hole needle tip for thicker marinades, sauces, or pastes, and use the multi-pinhole tip for thinner marinades, brines, beers, or wines. When not in use, you can clip your needle tips to the injector’s cap for easy storage. This injector features a stainless steel needle to evenly distribute marinade, enhancing flavor. Best for use with thinner basting liquids. Inquire about Marinade Injectors using the form below.